Applications are hereby invited In standard form of application as published in part IX of Assam Gazette from the Intending candidates who have passed the 6 (six) months Recorders Class Course Certificate from the Assam Survey and Settlement Training Centre, Dakhin Gaon Assam only and Citizen of India and permanent resident of Assam for filling up 24 (Twenty four) nos. of vacant post of Mondol In the amalgamated establishment of Deputy Commissioner, Nagaon. Educational Qualification: Candidates must have to be passed the HSLC or its equivalent examination. Pay: Pay band of Rs. 14,000.00-49,000.00 + grade pay of Rs.6200.00 and other allowances as admissible under Rule. Age: The age of the candidates must not be less than 18 years and not more than 38 years as on 01/01/2018. The upper age limit for candidates Is relaxable as per existing Govt Rules. Application Fee: No Treasury Challan Is needed against application. 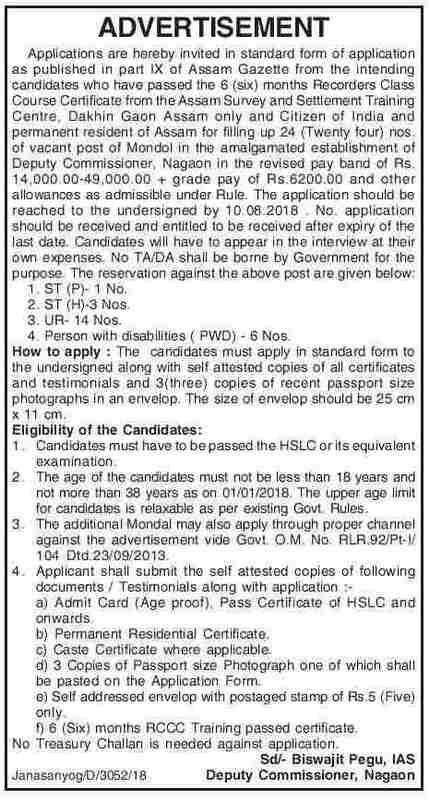 How to apply: The application should be reached to the Deputy Commissioner, Nagaon by 10/08/2018. No application should be received and entitled to be received after expiry of the last date. Candidates will have to appear In the Interview at their own expenses. No TA/DA shall be borne by Government for the purpose. The reservation against the above post are given below. The candidates must apply in standard form to the undersigned along with self attested copies of all certificates and testimonials and 3(three) copies of recent passport size photographs In an envelop. The size of envelope should be 25 cm x 11 cm. d) 3 Copies of Passport size Photograph one of which shall be pasted on the Application Form. e) Self addressed envelop with postage stamp of Rs.5 (Five) only. f) 6 (Six) months RCGC Training' passed certificate.